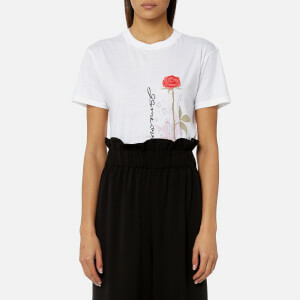 Women's black T-shirt from Ganni with a soft and comfortable cotton construction. Cut in a regular fit, the tee comprises a round neckline, short sleeves and dropped shoulders. Accentuated with a contrasting 'Snack Attack' print to the front. A straight hem and tonal stitching complete the design.